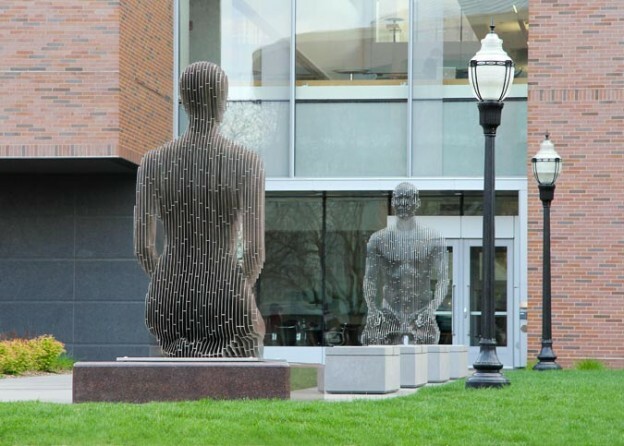 Julian Voss-Andreae is a German sculptor based in Portland, Oregon. Starting out as a painter he later changed course and studied physics, mathematics, and philosophy at the Universities of Berlin, Edinburgh and Vienna. 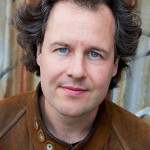 He pursued his graduate research in quantum physics, participating in an experiment considered one of the modern milestones of unifying our everyday intuition with the famously bizarre world of quantum physics. Inspired by his background in science, his work has captured the attention of multiple institutions and collectors in the United States and abroad. 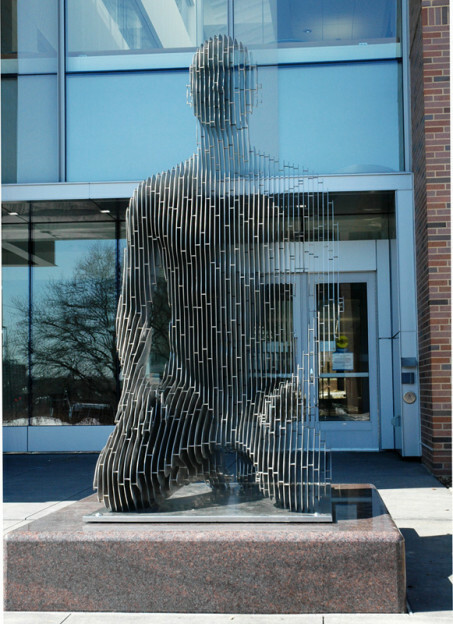 My design for a sculptural installation for the University of Minnesota’s new Physics and Nanotechnology Building is inspired by a view of the human body through the lens of quantum physics. The German title of the installation (literally “tension field”) originated in physics but is used in contemporary German almost exclusively in a metaphorical sense, implying a dynamic tension, often between polar opposites, that permeates everything in its vicinity. “Spannungsfeld” consists of two 10′ (3 m) tall figures in a basic kneeling pose, a male and a female, facing each other. The two figures represent nature’s omnipresent pairs of opposites. These dualities are a fundamental facet of nature and are found in Western science as well as in Eastern traditions. They are critical to the emergence of new levels of meaning in science, and, in the case of the two human genders, critical to the emergence of life. Like the positive and negative electric charge in physics or the yin-yang in Chinese philosophy, neither woman nor man can exist without the other. Inspired by quantum physics, I developed an approach that transforms the human figure into a large number of vertically arranged, parallel steel slices with constant spacing. This style creates the impression of a three-dimensional topological map, evoking the fundamental scientific act of measuring the world. 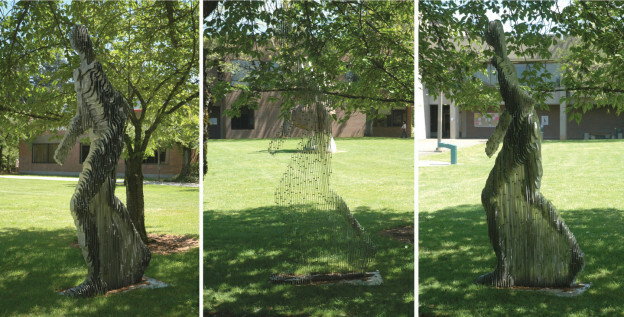 The visual effect this style produces is striking and echoes quantum physics’ paradoxical nature and its critical dependence on the observer’s point of view: On first glance appearing to consist of solid steel, the sculptures virtually disappear as the viewer moves past them, enticing the audience to interact playfully with these works. Conceptually, it is the very act of analysis through dissection that reveals the interconnectedness of the figures: Both sets of slices comprising the figures fall on the exact same planes and therefore appear as a continuation of each other and as manifestations of the same underlying ‘field’. As quantum physics suggests, and Eastern traditions have stressed for centuries, the world is fundamentally one, and everything and everybody we see is but a manifestation of an underlying wholeness. Ironically, it was the separation of object and subject that eventually forced us, through the advent of quantum physics, to see that nature, in its very essence, is indivisible. A human being seen as a quantum object. 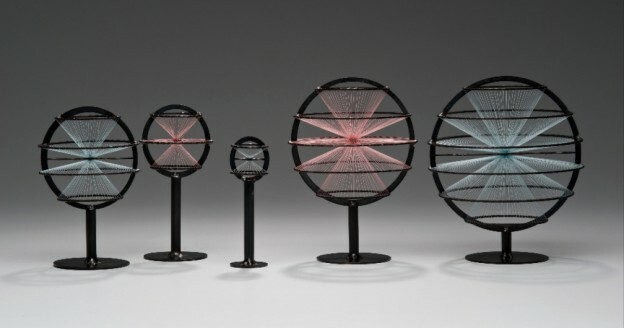 “Quantum Objects” was an exhibition of about thirty quantum physics-inspired sculptures on display at the American Center for Physics (Washington, D.C.).